The term "dendritic" is derived from "dendrite", and refers to markings in the stone which resemble fern-like, or branch-like growths of any kind. "Moss agate" was known to the Chinese, rather appropriately, as shuicao (water weeds). Like so many bottles of exciting material, the present bottle is exceptionally well made, of an elegant form and impeccably well hollowed. 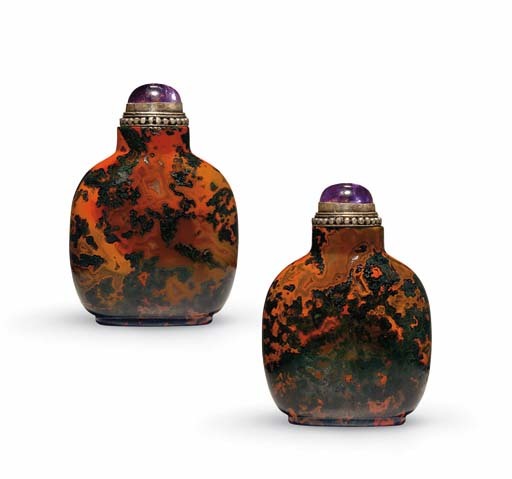 The coloring makes for one of the most exciting moss agate bottles known, and, as usual, a range of possible interpretations of the natural markings is possible: a glimpse of a carp swimming beneath the algae in a pond, a mysterious landscape, or seaweed in shallow water among them.